Any breed of dog that carries a merle gene can sometimes produce a condition called double merle. Double merle is not albino. Careful breeding and making sure the right people adopt the right dog has gone a long way to stop the needless mistreatment and premature death of some of these deaf and/or blind double-merle dogs. Even careful breeders, however, sometimes have parent dogs that carry, but not express the merle gene, and they don’t know there is a double merle until the puppies are born. Lots of people enjoy the merle coloring and dogs with one blue eye. Because merle dogs can bring higher prices, some breeders looking for a quick buck will purposely breed these dogs, some times when buying a merle, you might be purchasing a deaf and/or blind dog. If all a breeder is going for is this coloring, trouble follows. This is another reason to not buy puppies from a pet store. It is vital to purchase from a reputable breeder who knows the pedigree; even still, the double merle may show up, either from mutation, or it wasn’t recorded on the pedigree. Some breeding operations will put down these puppies at birth. Other puppies may spend their lives in a complete state of distress, often at the hands of well-intended owners. The most important thing is, don’t be afraid to love a deaf and/or blind dog. If you feel you are capable of training a deaf/blind dog, do your home work; ask about the rescues and dogs that need homes. There are lots of resources available to those willing to bring a “special needs” dog into their lives. There are lots of resources for training deaf dogs; be willing to spend the time and effort for these amazing pets. Breeders worth getting dogs from will give you as much or more information then you need — and will want follow ups. Nearly all the breeders I’ve talked with over the years say the same thing, they love hearing from the puppy owners, even with seemingly simple questions. It’s better to have someone that cares, than to wonder about the well being of a puppy. Double merle puppies are almost always deaf. Blindness is also another very common condition. Treating these puppies as you would treat a deaf and/or blind child means that these dogs are not throw-aways. They can be trained and become a valuable member of the family, even a working partner. 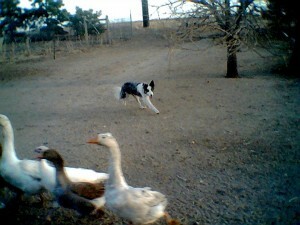 I specifically refer to two working farm dogs, Border collies Sadie and Breeze. Sadly Sadie is no longer with us, but the new hire on the farm, Breeze, is learning the job quickly. My sister has a free range poultry farm in Colorado, and her dogs are working members of the family. She is using American Sign Language in combination with other dog-training signals, to teach Breeze how to herd the birds. My sister’s first farm dog was a rescue. She was a hearing Border collie who came with a few issues that needed extra care. Later, when it was time to hire on a new helper, the only rescue Border collie in the area was deaf. Not one easily put off by “hopeless,” “troubled” “out of control”, my sister brought her home, and Sadie quickly became a loved and loving member of the family. Her “behavioral issues” vanished as she learned how to be a dog, what was allowed in her world, and what the rules were. The behavioral issues would only appear when Sadie became anxious. By learning what causes certain behaviors in our pets, we can better understand them and how best to live together. Consistent rules are very important to a well-behaved dog. Having a safe place for the dog is vital. With a blind dog, as with a blind child, let them feel safe in their home environment. Have a securely fenced yard, and when they first come home, be with them, take your time to walk around the yard, house, etc. Let the working senses take in the surroundings so they can smell and feel their way through the world, unhurried and unafraid. Even a deaf dog will bark. Barking is often a sign of distress — something’s not right in their world. It’s wrong to punish an anxious dog, this just builds on the anxiety. This is where the right person for the right dog is important. It is important to understand that an extremely common expression of anxiety in herding dogs is spinning. Spinning endlessly, chasing the tail, chewing the tail, sometimes to the point of chewing off ones owns tail is not funny; it’s devastating. An anxious dog can’t stop itself from spinning. As with some special-needs children, physical restraint is the only way to reach some dogs. This is especially true of the spinning/ tail-chewing dogs. These dogs can literally spend endless hours engaged in this behavior. These anxiety disorders can be diagnosed as OCD (obsessive compulsive disorder). Reconditioning and training can help these dogs learn to stop themselves from this crazed, mind-warping, endless spinning and chewing. We might be able to learn a lot from cross-species education. What can a specialist with autistic education teach us about dog training? And understand that what makes good herding are behaviors that can drive a person nuts. A good herding dog is on the verge of OCD as it is. Sometimes, disorders are treated with medications. As with people, some will argue for medications, some against. Find out what works best for you and your dog. For most dogs, it is vital to have steady and consistent training. For dogs, as with children that are easily overwhelmed, consistency is the key to mental stability. With an OCD dog, it is extremely important to over reward good behavior and ignore the bad. Not all rewards are food, many dogs are just as happy with praise or play — especially border collies. If you have a deaf dog that is barking, how do you address the anxiety? With Breeze, to be closed up in a dark crate only built on her anxiety, putting her to bed in an open room with a night light was the answer to stopping the barking all night. Because of her history, crate training is completely out of the question. Each dog is different. Even sighted and hearing dogs get anxious, and there is no magic fix for all dogs. Training and reassurance that in the owner’s world everything is OK goes a long way in calming the anxieties of the dog. Owners might have to look harder and longer to find what helps. Don’t give up, every pet in our lives can teach us something about ourselves and how to be a better human in the world — if we are only willing to take the time and effort to learn. I hope to do a follow up story about Breeze. She has had an incredibly sad start in the world. I’m happy to say she is learning to trust. She’s becoming a playful, yet obedient dog who can now stop herself from hours of endless spinning.